A flash of white against the frog-colored palette of a wet meadow. A loose cluster of white flowers atop a long, smooth stem. Each flower is an open bowl with the petals fused at the base, then tapering into six delicate points. 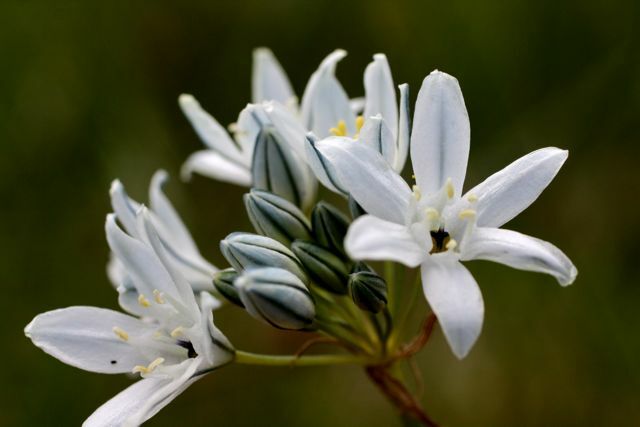 This is wild hyacinth, or Triteleia hyacinthina. 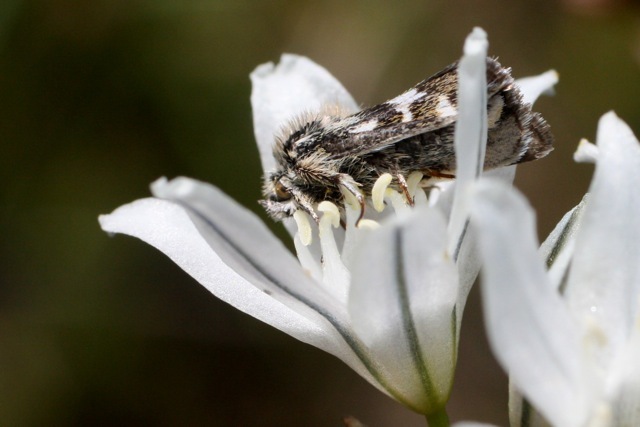 It grows in wetlands and along creeksides, as well as in grasslands and forests throughout much of the state. The six stamens alternate in height, and flatten out so their bases nearly meet, making what looks like a crown set inside the bowl of petals. Green ribs run up the middle of each fleshy white petal. There is another pale-colored Triteleia in the area (marsh triteleia, which can be whitish but is purple tinged – at least at the midrib if not elsewhere). You can tell the two apart because the wild hyacinth is bowl-shaped when seen from the side, while the marsh triteleia is narrower, shaped more like a funnel or a horn and the stamens are harder to see, hidden deep inside this vessel. There are a bunch of beautiful flowers in bloom right now, with clusters of white or purple blossoms atop long leafless stems. These are the brodiaeas, blue dicks and wally baskets, and even though they are quite distinct it can be oddly difficult to remember which is which. So I’m going to give an overview of their similarities and differences here, and then focus on some specific species in these groups throughout the week. This group of cousins all belong to the Liliaceae family, which you can tell because their petals and stamens come in multiples of three. 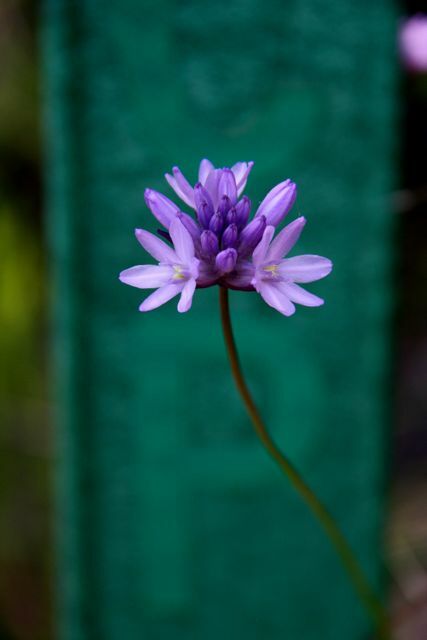 Because they are all so similar, botanists once thought they were all in the same genus as well, but now genetic and other work has determined they are actually different genera (but if you have an old guidebook, you’ll find them all under Brodiaea). All three have flowers that appear in a umbel at the top of the (usually long) leafless stalk. The flower petals are united at the base, and are always purple or white. But their differences are not hard to see. You can easily tell a wally basket (Triteleia, shown at top and below) because it has six stamens that alternate in heights so three are distinctly taller than the others. The stamens are fairly typical looking, with a stalk (“filament”) topped by a pollen-dusted anther. 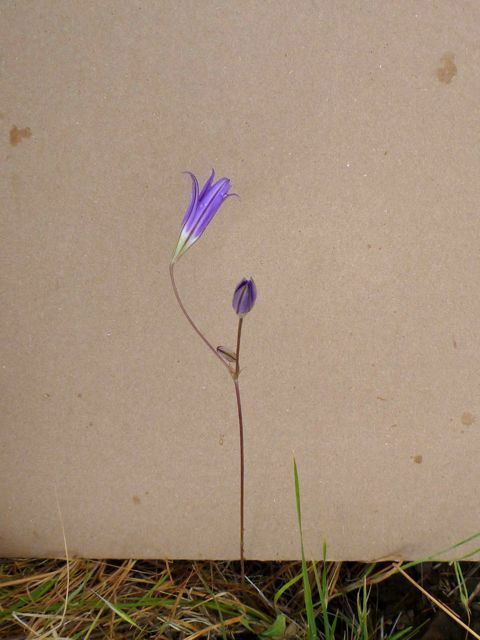 Both blue dicks (Dichelostemma) and brodiaeas (you guessed it: Brodiaea) have three stamens, and they are less typical looking – flat and tongue-like, arranged equally so they face each other like the three sides of a triangle; see the photo at the bottom of the page for a close-up. Within this group, you can tell the two apart because blue dicks have short flower stalks (“pedicels”), so the head of flowers appears dense and crowded together. Also their stalk is twisted, whereas the brodiaea stalk is straight. Brodieas also have longer pedicels, so the head of flowers looks more like a loose bouquet (though this example only has two flowers, you can still see how the two pedicels between the flowers and the stem is quite long). Et voila! Enjoy your botanizing! Masses of delicate easter-colored flowers fill fields and hillsides, standing as tall as your waist or even shoulder. These pale yellow, purple, and white flowers are wild radish, or Raphanus sativus. You can see a fantastic showing of them along the first part of the Pierce Point trail on the Point Reyes Penninsula. These flowers also taste good—take a trailside nibble or add flowers and pods to a salad for a spicy radish taste. And there are those four simple petals again! That’s right, the wild radish is in the Brassicaceae, or mustard, family that I wrote about last week. 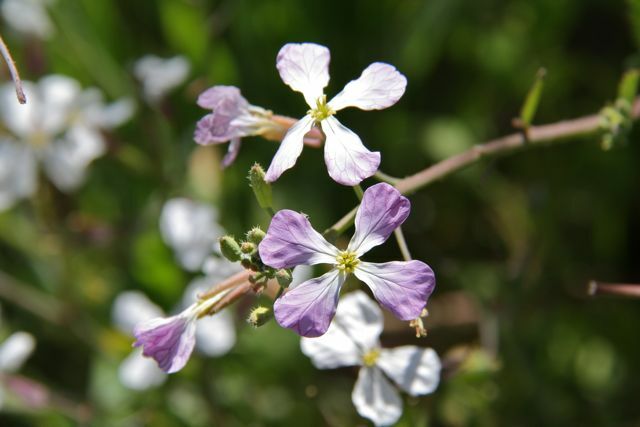 According to the Marin Flora, the local wild radish is actually a hybrid between R. sativus and its cousin, R. raphanistrum. It’s buckeye season – one of my favorite stages of spring. These spreading trees with their tall, pinkish-white spires of flowers can be seen along roadsides, streamsides, in mixed woodlands and even at the edge of pebbly beaches on Tomales Bay. I’ve seen Aesculus californica growing so close to the water that the lower branches were draped with streamers of dried eelgrass. This lovely tree is unique to California, and can be found across much of the state. It has loads of character, with knobby, gnarled trunks and wide palmately compound leaves. It leafs out during the winter, offering cool shade on hot days into the early summer, and then it goes dormant. In the fall it drops beautiful shiny chestnut-colored nuts (ok, actually they are “capsules” since the hard exterior contains several seeds). I like to gather them and use them for decoration. But don’t eat any! They are toxic, known to depress the nervous system, cause abortions in cattle and be toxic to bees. Native Americans would use extract of the seed topically (for hermerrhoids?!). In tough times the seeds were sometimes eaten (after careful preparation to leach the poison out). Buckeye also provided food in a different way: pouring a ground-up powder of the seed into a stream would stupify fish for easier catching! This is one of the most beautiful flowers of the Bay Area. It’s aptly named, with its complex blossom looking like a delicately wrought lantern nodding on a slender stem. The three upper sepals curve upward like a pagoda roof, while the fringed petals below curl inwards as if to protect a flame. It’s not hard to imagine them as fixtures in a tiny magical kingdom. 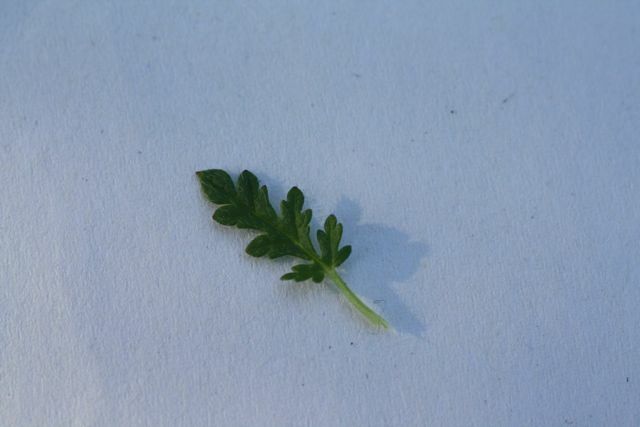 Keep your eye out for these little plants, and when you find one, look close! 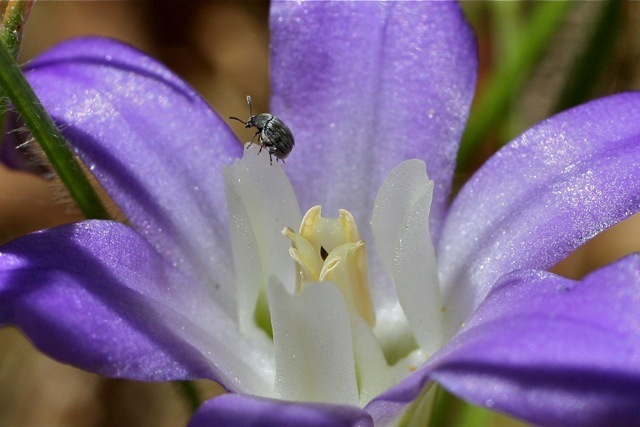 The fairy lantern (Calochortus amabalis) is endemic to northern California, and is pretty much restricted to the coast range north of San Francisco bay. As such, Marin County is toward the southern-most end of the species’ range, and it is a rare sight here. These photos were taken in Sonoma county, where it is much more common. Because all the parts are in threes, you can tell it is in the lily family, like the irises and blue-eyed grass. Rough hedge nettle is widespread in the area, and hedge nettles in general are easy to recognize. Though they don’t have the typical smell, hedge nettles are in the mint family! Mints are often hairy and smelly (like some rugged botanist-types that I know?!) and they have a tubular flower that usually is distinctly two-lipped. For the hedge nettles this is certainly the case. But the real giveaway for this family is that they have a square stem. Just roll it between your fingers to see what this means – all mint stems are distinctly four-sided (see the stem close-up below). There are other families that have square stems, but the many local species in the mint family (Lamiaceae) are by far the most common. Stachys rigida is usually found in dry places—woods, shrublands, or grasslands. There are other hedge nettles (such as S. chamissonis, with its showy purple flowers) that prefer wetlands but our S. rigida is almost always on slopes, in gravel, clay or rocky soil. And, if you want to get technical, you should know that the Marin Flora lists Stachys rigida var. quercitorum as the local variety. 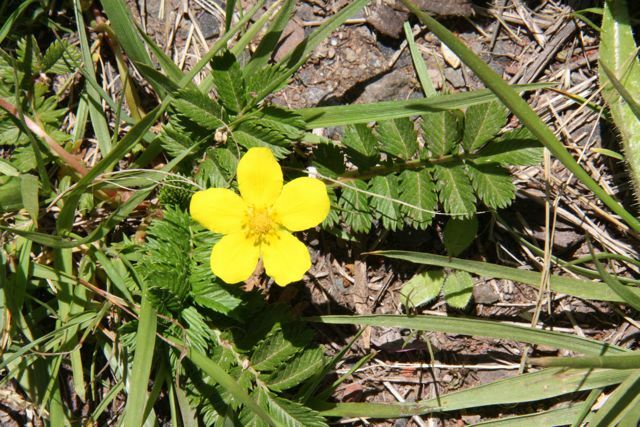 This is sunny little flower almost always grows in wetlands or creeksides, though it can be found elsewhere. The photo shown here was taken on a seemingly-dry trailside, but because it was on a hill I wouldn’t be surprised if it is wetter than it appeared. Potentilla anserina is the most common cinquefoil in the area. In general, cinquefoils have a very distinctive “look,” with five spreading petals and surrounding a central mound of many stamens. The leaves are composed of crinkly, jagged-edged leaflets. Often the leaflets are arranged in many pairs along the stem (as with this silverweed here), but sometimes they are in threes or in a fan shape. Once you’ve seen a few different species the similarities start to jump out at you! Long beaked stork’s bill is a ubiquitous sight in the fields of the bay area. This invasive little weed and its cousins, other types of stork’s bills, have naturalized across most of California. The long beaked stork’s bill (Erodium botrys) is distinctive because of the particularly long, beak-like seed pod, but also because of its leaf – it is the only one with a long narrow leaf that isn’t actually dissected into separate leaflets. 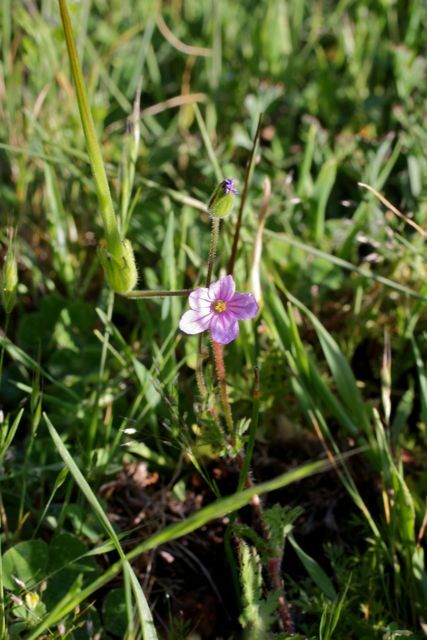 There are several species of wild geraniums with flowers that look quite a bit like those of stork’s bills – small, pinkish-purple. Again, look to the leaf to know what plant it is. The geraniums (sometimes called crane’s bills) have deeply dissected leaves that are overall roundish in shape. In other words, if you drew a line around the outside of the leaf, ignoring the details, you’d come up with a circle as opposed to the overall tongue-shaped leaves of the stork’s bills. 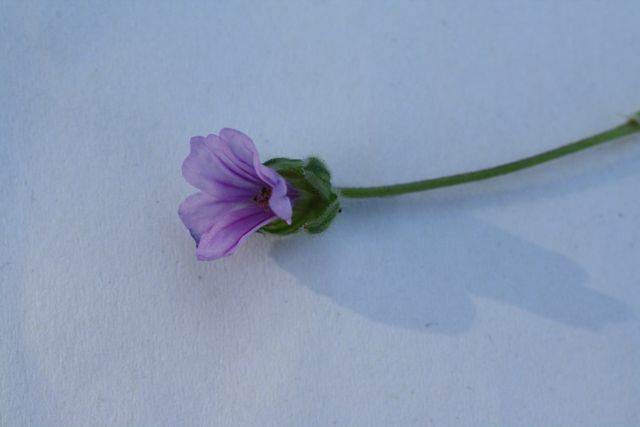 The wild geranium petals are usually notched at the end, giving them a toothed look. Almost all of the wild geraniums are also invasive, with a few exceptions. Tall spikes of white or purple flowers are bursting like flares across Marin. This is the season for foxglove, another striking-looking invasive. Native to all parts of Europe, it has now colonized much of North America, where it appears to prefer the coastal areas to the heartland. You can find it in from Alaska to Mexico, and on much of the east coast as well. Digitalis purpurea can grow to be taller than a full-grown person and is quick to colonize areas that have been disturbed such as road sides, logging or building sites. Foxglove is also highly toxic so don’t eat it!! Small amounts have been known to be fatal. Some of its other names give you a clue that this is a bad idea: Witches’ Gloves, Dead Men’s Bells, Bloody Fingers, and Fairy’s Glove just name a few. Yet in its noteworthy history, Digitalis was also used as a medicinal plant by herbalists. They were on to something: extracts from the plant are now used pharmaceutically to treat congestive heart failure. As much as I appreciate folk remedies, this is one I’m glad the scientific establishment has gotten involved with; messing around with a plant that supposedly killed some kids who drank the water from a vase containing foxgloves seems like a bad idea! Like a handful of precious jewels scattered on a rocky slope, this flower is easily missed but well worth a closer look. With single flowers spread out on a long, leafless stalk they can blend into the background. Each blossom is gathered at the base into a balloon that reminds me of the bell-shaped skirts at an old-fashioned ball. At the mouth, the four petals crinkle and flare outwards from a purple-tinged mouth. This is Streptanthus glandulosus ssp. Secundus. The ssp means “subspecies” – a lot of times this designation refers to very subtle differences within a species that a casual botanist isn’t interested in. But in this case, it means this flower is white while the others are dark purple. There are several different jewelflowers in the area, distinguished by their distinctive pouchlike shape, but this is the only white one listed in the Marin Flora. Jewelflowers are in the same family (Brassicaceae) as the common wild mustards and radish weeds that grow all over, but their signature blossoms are different from most members of this group, which have simple four-petalled flowers. Milkmaids are a good example of a classic brassica.